Are you wild – or whipped – at heart? Are you a Christian guy who is thinking about repenting of his niceness? You’ll want to see my article published this month in Catapult Magazine. 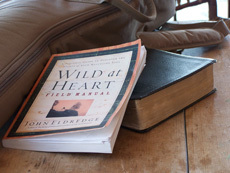 When John Eldredge’s Wild at Heart came out in 2001, Evangelical men latched on to the existentialist bad-boy path to Christian manhood. According to the book, the problem was that men in the churches had become sissified by a sentimental, moralistic, inauthentic environment. The solution could be found in pursuing the “wild” road of authentic, manly living. Eldredge’s indebtedness to the mythopoetic men’s movement shows through, albeit in a superficial way: William Wallace and Luke Skywalker replace the ancient fairy tales, Jesus Christ replaces the “I” to some extent. Wild at Heart struck that perfect marketability for Evangelical men: conservative family values + shame-healing + anti-Victorian backlash + self help group therapy + badass role models. Seven years later, men’s ministries are holding Wild at Heart retreats, the latest cropping up in Peoria, IL. Such men eagerly report that they go on such weekends to buck the system, to get fierce, to prove to themselves that they can be, well, “wild.” It’s interesting, then, that the primary way these men demonstrate their wildness is by (to quote them) “learning to communicate.” They admit their failing as husbands and fathers. They confess their well-hidden wimpiness. They acquire new skills to speak honestly with God, themselves, and their loved ones. Masculinities trade in fecund contradictions. Evangelical men, for this reason and that, spend time being irresponsible to the world around them, if only for a Saturday, in order to recapture the strength to dive back into their world of responsibilities and responsiveness.